Thread Check, Inc. offers American Petroleum Institute - API thread gauges to Spec. Q1, Spec. 5B, Spec. 7, Spec. 11B as well as many special API gages. Our engineers have served on various subcommittees concerning API gages. API gauges come in all types include casing-round, line pipe, tubing-non upset, tubing-external upset, tubing-integral joint, extreme line casing, NC connections, regular, full hole, internal flush, H-90, slim hole, extra hole, wide open, AOH, PAC, XHole, Sucker rods B1 to B6, Sucker rods P1 to P6, Mining, BECO, D1-22, D1-42, American National special threads, tapered thread gauges-AWWA, and many special custom gauges. Thread Check stocks many popular sizes of API gauges and API thread gauges, available for immediate delivery. Thread Check is a proud member of the American Petroleum Institute. For further assistance with identifying which API thread gages or API thread gauges you need, please contact our knowledgeable sales engineering staff. For more technical info, please reference our data sheet. Thread Check supplies API Gauges Per API Specification 7-2. NC Connections are rotary shoulder connections having the V‐040, V050 or V‐055 thread form. REG‐ Regular Style Connections are rotary shoulder connections having the V‐040, V‐050 or V055 thread forms. IF Connections are rotary shouldered connections having the V-038R thread forms. H90 Connections are rotary shouldered connections having 90° thread forms. SLH90 Style Connections are rotary shouldered connections having 90° thread forms and heavy truncation on the thread. OH style or Open-Hole style rotary shouldered connections have the V076 thread form. GOST Z Style Connections are covered under a Russian standard and have the V-038R, V-040 or V-050 thread form. Gaging practice and thread inspection should conform to the requirements of API Spec 7-2. The gauging of the above connections is also referenced as ISO 10424-2. The box thread is the internal (female) thread of a rotary shouldered connection. The box connection or box end is the threaded connection on oil country tubular goods with internal (female) threads. The pin thread is the external(male) thread of a rotary shouldered connection. The pin connection or pin end is the threaded connection on oil country tubular goods with external (male) threads. The mating stand-off is the stand-off between the thread plug and thread ring members of a gauge set. The gage point on an API thread is the imaginary plane, perpendicular to the thread axis of rotary shouldered connections at which the pitch diameter at gage point is measured. This plane is located .625 inches from the make-up shoulder of the pin thread. The interchange stand-off refers to the stand-off between each thread gauge set and a corresponding thread gauge in the ranking from working gauge, reference master gauge, regional master gauge and grand master gauge. The make-up shoulder is the sealing shoulder on a rotary shouldered connection. Master gauges are used for the calibration of working gauges. Working gauges are used to gauge product. The first perfect thread is the thread furthest from the sealing face on a pin or closest to the sealing face on a box where both the crest and the root are fully formed. For further assistance with our API gages, please contact our knowledgeable sales engineering staff. We will be happy to assist you in identifying the correct API gauges for your specific needs. For more technical info, please reference our data sheet. Thread Check Supplies API Thread Gauges API specification 5B for casing threads, tubing threads, and line pipe threads. Casings are the critical structural component of the well. All drilled wells for oil and gas production require casings to provide sufficient strength and functionality. 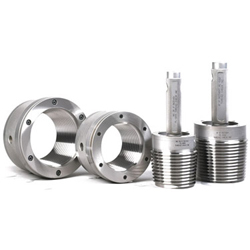 Long and short Couplings with rounded thread. Couplings with asymmetrical trapezoidal buttress threads. Extreme-line casing with trapezoidal thread without coupling. Threads are used as mechanical means to assemble and hold the mating joints together during axial tension or compression. All casing threads are not designed or intended to be leak resistant when made up. Information on casing and tubing thread dimensions can be found in API Spec. 5C2, Performance Properties of Casing, Tubing, and Drill pipe. In round thread casing, two small leak paths are located at the crest and root of each thread. A much larger leak path is present in buttress threads. This is found at the root of the coupling thread and along the stabbing flank. Thread compounds are required to fill these gaps and provide leak resistance. The leak resistance can be improved by using API connections with tighter thread tolerances. The use of zinc or tin coated plating on the coupling will result in tighter fits and better leak resistance. For further assistance with our API thread gauges, please contact our knowledgeable sales engineering staff. Thread Check Inc. We will be happy to assist you in identifying the correct API thread gages for your specific needs. For more technical info, please reference our data sheet. Thread Check Inc. supplies API Thread Gages for buttress thread casings, short thread casings and long thread casings. Tubing is placed within a well and is the conduit to transport fluids to the surface or inject fluids into a formation. Tubing should be threaded and coupled unless and stated otherwise. Tubing strings are fitted inside the installed casings. The diameter of tubing strings must be specified correctly to allow fluids to flow efficiently or to enable installation of artificial lift equipment. Tubing string diameters that are too small can cause large friction losses and limit production. It also may severely restrict the type and size of artificial lift equipment. Tubing strings that are too large may cause unstable flow and complications with production. The tubing must properly fit inside the installed casing. API tubing sizes range from outside diameters of 1.050 inches to 4.500 inches. High flow rate wells may use tubing larger than 4½ in. The most common types of tubing are external upset tubing– EUE/EUT and non-upset tubing-NUE/EUT per API Spec 5B. Thread Check supplies the full range of API thread plug and thread ring gages for external upset tubing and non-upset tubing per API spec 5B. For further assistance with our API gauges, please contact our knowledgeable sales engineering staff. We will be happy to assist you in identifying the correct API thread gauges for your specific needs. For more technical info, please reference our data sheet.